Greece is big on festivals, and especially Crete. Festivals and events are held throughout the year, and it's a great experience if you happen to be in Crete when something is being celebrated. In addition to the public and religious holidays, and the Saints’ Days and Name Days (the equivalent of birthdays) celebrated nationwide, Crete celebrates the island’s fertility with festivals devoted to wine, sultanas, chestnuts and other produce, and on top of that the major towns hold annual arts and cultural festivals too. The Greeks celebrate not their birthday but their name day – the feast day of the saint after which they are named. So, every Maria or every Mikalis in one area will get together to celebrate in some way. This frequently means a big party. If you happen upon such an event, you will be made very welcome, although a small payment may be requested of everyone to cover the cost of food and drink. Dancing and music frequently follow the meal. 1 New Year's Day, the Feast of St Basil. Public Holiday. 6 Feast of the Epiphany and the Blessing of the Waters, celebrated in ports around the island. 25 Independence Day. Public Holiday celebrating the commencement of the 1821 Revolution against the Turks. Also the Feast of the Annunciation. Celebrated forty days before Easter in many places, notably Sitia. The dates vary and are usually different from the Christian Easter, but it is the biggest festival in the Greek Orthodox Year. There are religious processions which build up to Mass on Saturday night, followed by feasting on Easter Sunday. Good Friday, Easter Sunday and Easter Monday are all Public Holidays in Greece. 23 The Feast of Ayios Yiorgios, St George, the patron saint of shepherds. Much feasting in many rural communities. 1 May Day, when many people traditionally go on picnics into the countryside. Public Holiday. 20 The Battle of Crete. Commemorated with events in and around Chania for up to a week. 21 The Feast of Saints Constantine and Helena, celebrated in many churches and monasteries named after them, most notably the Arkadi Monastery. 24 The Feast of St John the Baptist. Late June. Naval Week, most notably celebrated in Soudha Bay. Whit Sunday and Whit Monday are movable feasts celebrated seven weeks after Easter Sunday and Monday. Both are Public Holidays. The Summer Arts Festival in Iraklion continues throughout the summer months. From early July to mid-August the cultural festival called Kornaria takes place in Sitia. In August and September the Renaissance Festival including international drama and music performances takes place in Rethymnon. Late July. Rethymnon Wine Festival. Two weeks of tastings with music and dancing. 6 The Metamorphosis. Religious services and feasting, notably in Voukoulies (near Chania), Males (near Ierapetra) and Zakros, on the east coast. 15 The Feast of the Assumption, a Public Holiday. 25 The Feast of Ayios Titos, Crete’s patron saint. Celebrated across the island and with large processions in Iraklion. Mid-August. The Sitia Sultana Festival lasts for a week and celebrates not only the local sultanas but the original grapes… and of course the wine made from them. Much feasting. Late August. A traditional Cretan wedding takes place in Kritsa, to which all visitors to the island are invited. Late August. On the night of the last full moon in August, a cultural event takes place in the Fortress at Sitia. 14 Feast of Ayios Stavros, a religious holiday celebrated in villages around Chania. Mid-October. The Chestnut Festival takes place in western Crete in and around the village of Elos. 28 Ochi Day, a Public Holiday celebrated throughout Greece to commemorate the occasion when the Greek General Metaxas gave a one-word response, Ochi (‘No’), to Mussolini’s request to allow Italian troops into Greece in 1940. 7-9 The great explosion at the Arkadi Monastery is commemorated there. 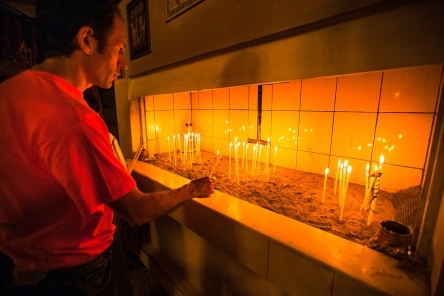 21 Local holiday dedicated to the Mother of God with a service in the Cathedral in Chania. 6 Feast of Agios Nikolaos, the patron saint of seafarers, celebrated most notably in Agios Nikolaos itself, of course, but also in other smaller places around Crete which have the same name. 25 and 26. Christmas. Both Public Holidays in Greece.